After an adolescent prank leads to a stranger’s death, Alvis Maloney rambles westward. He lands in a small North Carolina town and falls in love—in love with his neighbor Molly, with a lonesome quarterback called Miles, with a whole community of enduring misfits and losers. But at the same time, another life takes shape in Maloney’s dreamlike visions: a horse named Forever, a princess with hypochondria, and an electric city that’s always just out of reach. As these two promises of home fight for their hold on Maloney, the story careens toward disaster, and in the end Maloney must choose between love and redemption. 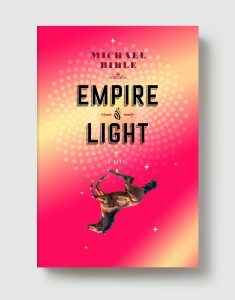 From the author Electric Literature called “one of the most interesting and exciting new novelists in years,” Michael Bible’s Empire of Light blooms with mystical imagination and a hopeful heart. MICHAEL BIBLE is originally from North Carolina. His work has appeared in the Oxford American, The Paris Review Daily, Al-Jazeera America, ESPN The Magazine, and New York Tyrant Magazine. He is a former bookseller at Square Books in Oxford, Mississippi, and lives in New York.